Swarovski Bead 5003 Disco Ball - when Dazzle you Must! Swarovski Crystal Bead 5003 Disco Ball is truly appropriately named. This bead has more superbly cut, precision, high-grade facets than any other. And it is these facets that make it seem as if they are indeed an endlessly turning disco ball as light is unendingly reflected and refracted with every move and gesture. It is an continuous, dazzling, sparkle bonanza that goes on and on. As with all Swarovski crystal beads, the precision cuts and lead content guarantees you the best brilliance and amazing perfections. This is part of the unrivalled brilliance of SWAROVSKI ELEMENTS. View or Download this Swarovski Color Chart for Beads for your color convenience: Swarovski CREATE YOUR STYLE Beads SS2013 Color Chart (.pdf, approx. 500KB). You can also always get the latest Color Charts from our Swarovski Information Center's Colors section. Not all the colors shown in the color chart will necessarily be available for Swarovski Bead 5003 Disco Ball. Use the chart-matrix below to determine that. Click on the thumnail line drawing for a bigger image. 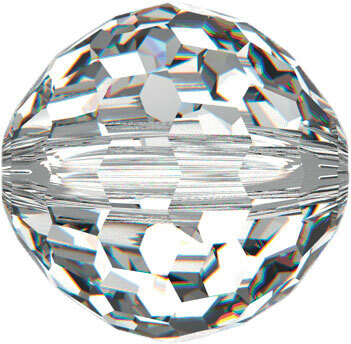 Here is a lovely sized image (from Swarovski, used with authorized permission) showing how magnificent the bead is. It is yummy enough to lick!!! It is a shame that this 5003 Disco Ball Bead does not come in more colours. However there is always hope. Twice per year, Swarovski releases their Innovations - which is a collection of new shapes, new colors, new sizes, and so on. Perhaps to date, it has been technologically difficult to produce this bead. And it is not a wonder, given how many facets it has and how precise those facets are. This difficulty is also reflected in the price. Though given the extra brilliance this bead captures and yields, it surely is very tempting. Swarovsky Bead 5003 Disco Ball is available in these sizes. I invite you over to our Free Jewelry Patterns for a selection of beaded jewlery and jewelry making tutorials, instructions, and ideas. Many of the free patterns are made available to you directly from CREATE YOUR STYLE with SWAROVSKI ELEMENTS.